Still a few days to kill before I need to be in Montenegro so I decided to follow up a tip from a local I spoke to whilst staying in Shkodër. He suggested I should take a coach tour to Lake Komani. I think he was only suggesting this because he ran tours to the lake, but it got me interested so after checking out the map I decided I would make my own way there the next day. 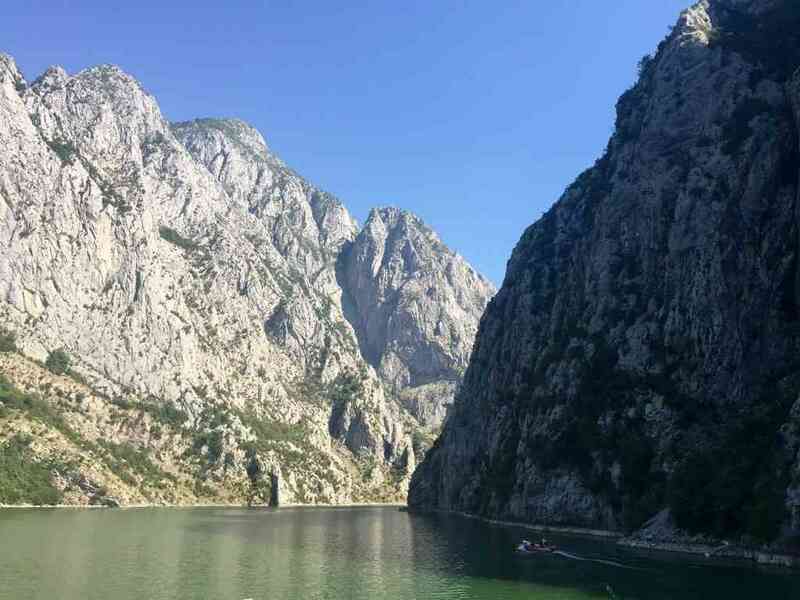 Lake Komani is not far from Shkodër, only about 60km, but after heading south and turning of the main road to head inland the road quickly turns to gravel and potholes. I passed a sign post for the town of Puke and continued towards the lake, the road didn’t get any better as it twisted through the rocky scenery. I could see the river not far below on the left and there where trees and rock face on the right. Occasionally I would see evidence of fire having destroyed large areas of trees, whether started naturally or deliberately I don’t know. Luckily there was not much in the way of traffic, apart from the occasional car or van carefully threading its way around or through the potholes that I was easily able to out manoeuvre and pass by or overtake. Being fairly remote there wasn’t much going on along the road, however I did see a couple of lanes leading up to farm houses (or holiday homes?) and occasionally saw the odd goat and even a pig at one point. The worst section of road was only about 30km but it took about one and a half hours to reach the Koman Hydroelectric Power Station at this end of the lake. After following a very dark and damp single track tunnel through the mountain for about half a kilometre I reached a dead end at the lake shore. There was no more road, and the only way to continue was by ferry. It was late afternoon and the ferry took 3 hours there and 3 hours back so I wasn’t going to do that today. I retraced my track back through the tunnel to a small bar a couple of kms away and had a drink and salad whilst I decided what to do next. I’d noticed a campsite across the road, so after taking a quick look pitched my tent and went to look for beer. Leaving my bike at the campsite, I got a lift the short distance back to the ferry port along with some other campers. We negotiated our way onto the ferry and after a short wait, were heading along the river Drin. Putting aside all the plastic bottles and other rubbish in the river it was quite picturesque. The ferry moved slowly along the river so there was plenty of time to take it all in and there were hardly any signs of life along the banks apart from the occasional fisherman or farmer or glimpse of a road running along the ledge. There are no facilities on the ferry so there is nothing to do apart from watch the scenery go by, so after three hours it’s quite a relief to arrive at Fierza and land. Except, there is just as little here, just a ferry jetty. Some of the passengers leave and continue their journey onwards but most just wait for the ferry back.